Hello, I am Deborah Maragopoulos MN FNP-BC, a board certified family nurse practitioner specializing in hormones and natural therapies. As an intuitive integrative medical healer, I strive to get to the root of dis-ease. At the surface, the roots are biochemical. Diving deeper psychological roots can be uncovered, but the core issues are often spiritual. The soul speaks through the body in the symbolic language of dis-ease. Full Circle Family Health is where I blend the Art of Healing with the Science of Medicine. The time is ripe for me to share my pearls of wisdom with the world. Intuitively, I felt that these children’s brains needed nourishment. Their parents willingly mixed the “brew” I prescribed because it worked, but they begged me to formulate a nutritional supplement to make it easier. So I began intense research. I was stymied until my son suggested I ask to be shown what to make. The answer came in a dream. In the dream my most challenging patients came to drink from a chalice I held and were healed. In the morning I asked what was in the cup. The answer came as seven Aramaic letters that amazingly translated into the seven amino acids I had been studying related to the hypothalamus. And the dream repeated itself every night for three months until an entire nutritional formula was revealed. brain chemistry. Everything essential to life is orchestrated by your hypothalamus. Your hormones sing and your DNA dances. Feed the hypothalamus and harmonize the symphony of hormones, then the dance of the DNA can express health and vitality. Three years after clinical trials were completed, my nutraceutical formula, Genesis Gold®, was available to the public. …I dreamt I was Mary Magdalen dancing down the streets of Nazareth. Once again in Aramaic! My writing took me away from my first creation—Genesis Gold®—yet with its support I was able to balance family, patients, and writing. LoveDance: Awakening the Divine Daughter is the story of Mary Magdalen awakening to her truth. A healer, a dancer, a woman, Mary’s voice was lost in history. Written in Mary’s passionate perspective, the present tense narrative engages the reader to truly experience HERstory. The Sacred Feminine is so deliciously infused into the book that you cannot help but join the dance. It turns out that I did write a healing book that delivers in story form pearls of healing wisdom. I wanted to give a portion of my proceeds to a charity, but there are so many from which to choose. So I founded Divine Daughters Unite—a nonprofit designed to empower young women through compassionate service. The board of Divine Daughters Unite is made up primarily of young women who decide what service projects to do each year and which charities they will support. The mission is to unite Divine Daughters across the globe. When you heal a woman, she heals her family, and her community. All my proceeds from the sale of my books and 13% of Genesis Health Products profits supports Divine Daughters Unite. Although my medical message revolves around keeping Hormones in Harmony® as the key to optimal health, I think the title of my novel sums up my purpose best. Life is a dance of love. Love connects us all and our Dance is the way we present ourselves to the world. If Love is at the center of everything, like an axle of a wheel, the Dance is the rim, transporting us through this dimension. 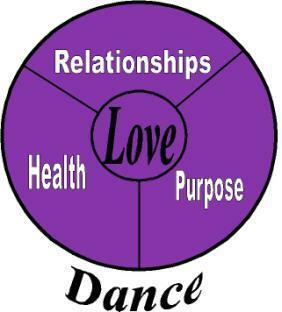 Within the LoveDance® lies a sacred triad. Relationships, Health, & Purpose. Relationships are mirrors of our souls. Loving relationships with my soulmate, my children, my family, my friends, my patients, my animals, even the earth are the foundation for my being. Purpose is life’s work, the reason we are here, our mission. My purpose is most fulfilling when it enhances my intimate relationships. Health of body, mind, and soul is crucial to fulfilling our life purpose. My physical, mental and spiritual health is a harmonious vibration by which my family, friends and patients might join my Dance. All are connected through Love. Like energy which brings matter into form, Love defines our Dance.